Here is another important warning to pass on and take note of, this time it’s regarding a potential Siemens tumble dryer fire risk. The only dryers affected by this specific notice are ones manufactured in 2002. What is the fire risk? Siemens haven’t released any model numbers, which is very inconvenient for customers and unusual. They say models affected look similar to the photo on this page and were manufactured in 2002. The lack of model numbers means all customers with a Siemens tumble dryer that could have been made in 2002 have to find their model and serial numbers and check online. 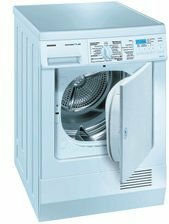 Go to the Siemens web site and enter your model and batch number (which should be behind the door) into their form on this page Siemens: Tumble Dryer Safety Action. Note that this safety notice affects dryers manufactured in 2002 so if you bought yours before 2002 it shouldn’t be affected. However, if you bought it in 2003 it is possible that it was still manufactured in 2002 so make sure you check. Is it safe to leave appliances running when out – or in bed?